Other than over-salted egg drop soup in a Chinese restaurant, I don’t know that I ever had egg in a soup recipe until recently. 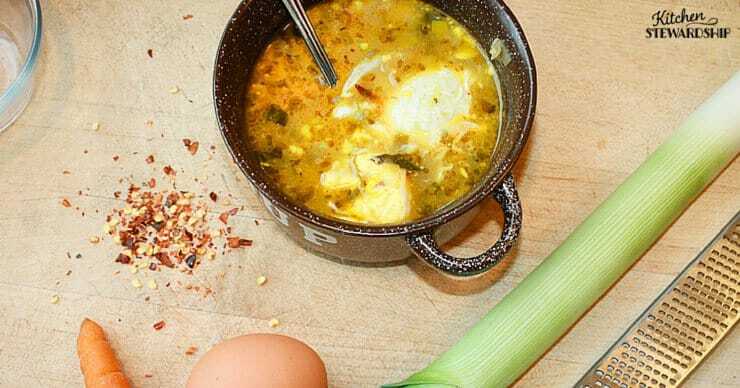 It turns out the creamy egg yolk and the nourishing fats swimming in all that immunity-boosting broth is becoming one of my favorite comfort foods, and I’m excited to share this recipe with you in our Nourishing Soup Series this month. As members of the Allium family, garlic and leeks both have properties that survive cooking that are anti-inflammatory, promote heart health, and have antioxidant properties. 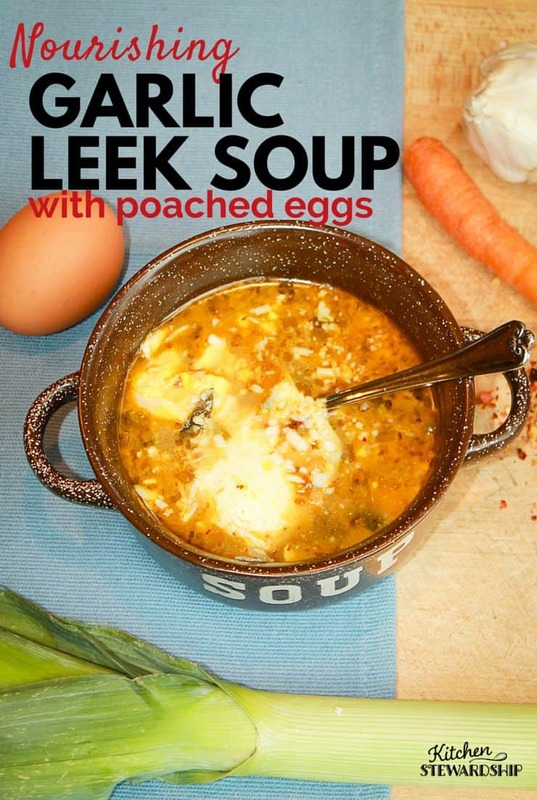 Leeks have all sorts of great health benefits, including being a great source of folate, so make this soup for women in your life who are expecting (and throw an extra egg in their bowl). 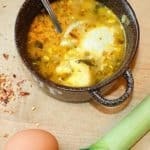 Garlic Leek Soup makes an excellent simple “starter soup” for a meat-based meal, by itself as a simple dinner with bread and a salad, or even for breakfast! I served it with baked oatmeal once when we had company for brunch after church. I definitely advocate making your own easy chicken stock, but sometimes you just want something quick and easy for those busy days. Thrive Market will deliver some to your door – Pacific brand makes Chicken Bone Stock for a good price. You can even get 15% off your first order, no coupon required. 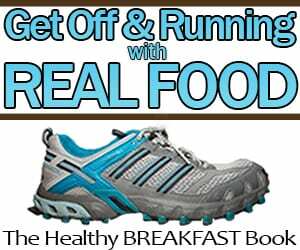 No running to the store and you’ll be ready to make dinner at a moment’s notice. Although I do reuse my chicken bones to make multiple batches of broth, this soup is one that really requires the “firsts” and not the “thirds.” As Diana says in her lovely Lentil Soup recipe, it takes a good broth to make really spectacular soup. Let the broth shine on center stage! You’ll want your chicken bones to simmer at least 8 hours in your homemade stock, more if you can swing it, and be sure to add garlic, onions, carrots and celery, maybe even leeks, for the last hour or two. Roast them for even more flavor, and add fresh parsley and kombu (seaweed) if you have it for the last 10-20 minutes. Don’t skimp on the unrefined sea salt as you make the soup either, since everything will be a bit flat without it. And of course, pastured eggs will have the richest flavor (and nutrition) in that yolk. The egg in this recipe is poached, more or less, although I had to look that up to double check that poaching was in fact what I was doing. It looks crazy, but even at a full boil, it more or less holds together. This egg was good, but a little less time, a slightly runny yolk = even better. Don’t follow my example – better to use a slow simmer, maybe a splash of vinegar to make the egg hold together, and follow these directions – but know that if you let the water get out of hand, it’ll all still work out. I recommend not covering the pot though, saves a lot of clean up time. Here’s one more poached egg tutorial that has a lot of minute but helpful tips (but I would never use that much vinegar). Crush garlic and set aside to maximize health benefits. Melt fat over medium heat. Saute the leeks until softened, then add carrots for a few minutes, then add garlic for the last minute. Pour in stock and add salt, paprika, oregano and crushed red pepper. 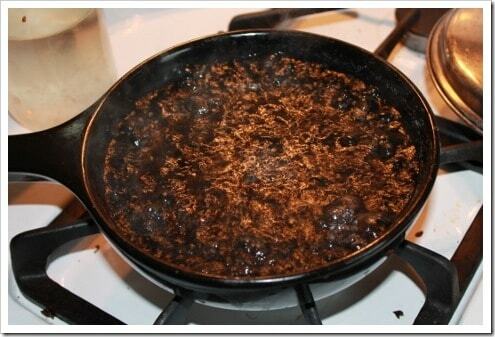 Bring to a boil and reduce to a simmer for about 10 minutes. 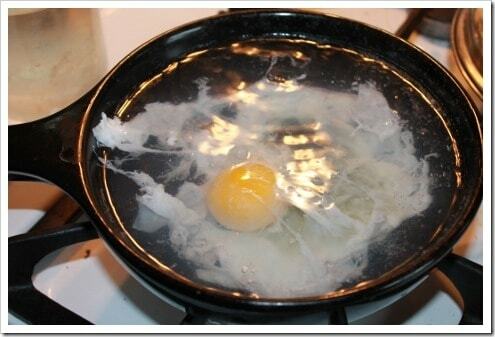 Meanwhile, simmer an inch or two of water in a frying pan or shallow pot (enough to cover an egg). Add a few pinches of salt. Drop enough eggs in for one per eater (4 is likely the maximum for a single pan) and set the timer for 3-4 minutes, cooking on medium low with the cover off. If you’re cooking for many, you can set the cooked eggs aside, then warm them up for a minute in the hot water or just rely on the hot soup to heat them up in the bowl. 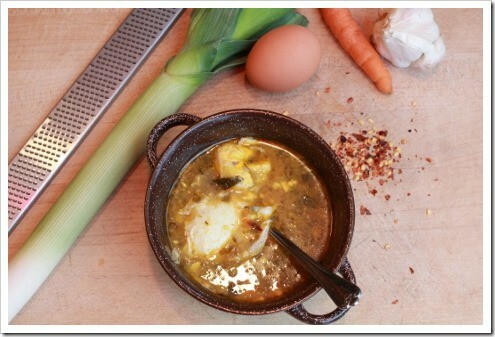 Using a slotted spoon, move each poached egg into a bowl then ladle the finished soup on top. Serve with Parmesan cheese at the table. * For an even simpler soup, omit the carrots. * Serve as a starter soup, breakfast side or main dish with crusty bread and a big salad. * If you want to make a double batch, the soup base freezes excellently, and then you can make eggs as needed for leftovers. * Inspired by the Spanish Garlic Soup in Kimi Harris’s awesome soup book, Ladled. Gratineed Leeks (side dish) – I actually used the tops from this recipe plus one more small leek to make the garlic leek soup in the photos on this page. Leeks are sturdy and easy to store for a few weeks in the fridge, and you can also slice them up and freeze without blanching for future soups. Save the tops and ends for making stock. Perfect timing on sharing this recipe! I just bought some leeks, since I’ve been really wanting some (strange preggo craving!) and didn’t know what to do with them. I’ve also been wanting soup since it is getting cooler out. Thank you for sharing! On another note, have you seen the videos of the Savior’s life at biblevideos.org? They are really well done and awesome for kids. This sounds great, thanks! Q: can you poach right in the soup and then serve, or not a good idea for some reason? hmm…I don’t have that many eggs on hand, but I do have some pastured pork sausage…I think I will substitute. Looks good! Wouldn’t it be easier (and save dishes) to just drop the eggs into the soup a few minutes before you’re ready to serve it? That should poach them right up! I have heard it works better to poach the eggs without salt in the water. I never tried that and always messed poached eggs before, and im not feeling adventurous so I will just make boiled eggs and slice them. By the way, I always have them in hand along with dried fruits for whenever I wanna go walk in the park and stay there for lunch. Tried many sorts of foods including sandwiches but thats what works best for me as a takeaway. I’m going to pressure can this for 75 minutes at 11 pounds of pressure and then have a few quick meals with only a poached egg standing between me and a yummy nutritious dinner. I just made this last night and it was sooo yummy! I did everything exactly like the recipe, except I tossed some white wine in the broth, and mixed some homemade fermented sauerkraut into our soup at the table. The sauerkraut was a great addition, as well–made the broth more tangy and yummy! I had no trouble poaching the eggs. 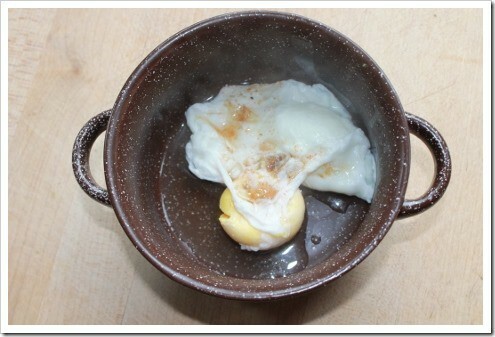 I used water with a bit of white vinegar added and just sprinkled salt on top of the eggs after they started cooking. I used our fresh eggs from our ducks and chickens, collected the day before… maybe the freshness helped them hold together? Thanks for a great recipe. It was delicious! I have this fear of leeks…it’s weird. Bad experience man. 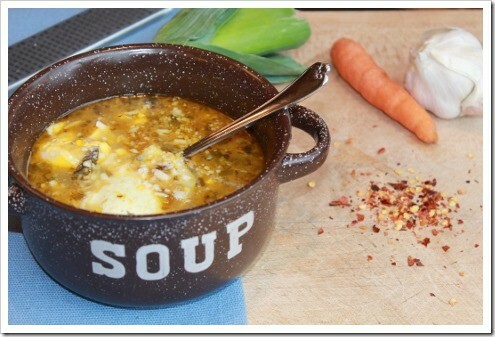 Ooh, if you’re new to egg in soup, try avgolemeno soup. Basically it’s just chicken broth and rice (or you can sub in whatever you like) but then you mix an egg with lemon juice and slowly pour it in so it cooks in the soup. It’s more of an “invisible” egg — mostly just thickens the soup, with some little tiny shreds of egg white. And then you sprinkle the whole pot with lots of dill. 😀 Mmmmm …. I used to make it every afternoon for an after school snack.